The local Apple Store has Lacie Thunderbolt drives in stock in both 2TB and 3TB’s. 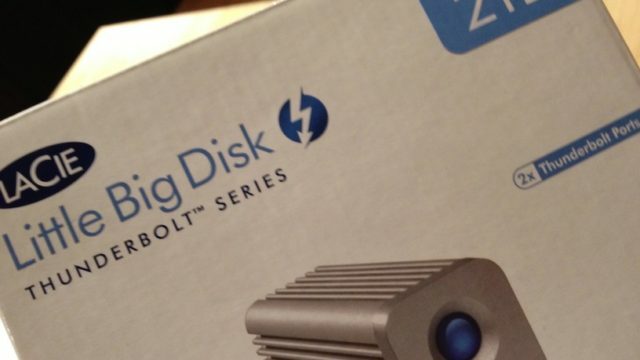 The 2TB is a whopping $579.95…and even with our measly Apple Corporate discount its still way over priced. After getting it home I was dissappointed to find that it is Thunderbolt only. It does include two Thunderbolt ports for daisey chaining multiple devices or drives, but there are no legacy options which limits the drives uses. The other dissappointment was the fact that it requires an external 120v power supply…no power thru Thunderbolt….making the tiny form factor of the drive far less convienient than it appears. And finally, for $580 bucks…they dont even include a Thunderbolt cable, so back to the Apple store for a $50 add on. The good news is this baby is fast. I plugged it in and within two minutes was copying the contents of my Macbook Pro…all 488GB in less than 1 hour and 23 minutes.